(NaturalNews) Proponents of genetically modified organisms (GMOs) purport that there is no real difference between organic and non-organic foods, since both are molded by the hands of man. Once the surface of non-organic food is scratched and the layers are pealed back, however, the nutritional quality unearthed is by no means similar to whole organic food. That is at least what the largest study thus far comparing organic to non-organic animal products suggests. The study reviewed more than 200 scientific papers, which examined the difference between organic and non-organic milk and meat products. The researchers found that organic meat and milk products had far higher levels of omega-3 fatty acids in comparison to non-organic contenders. The human body can produce most fats from raw ingredients and other fat. This isn't true with respect to omega-3 fatty acids, however. They are essential fats, meaning the body cannot produce them by itself but must obtain them from food. The human brain is largely made up of omega-3 fatty acids, meaning organic food is literally brain food. 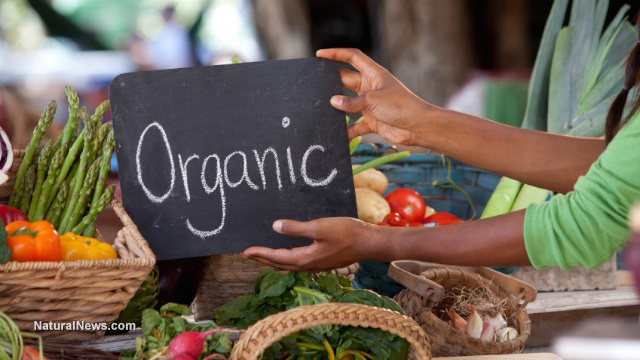 It is of course no secret that organic food has better nutritional quality than non-organic food. For years, however, GMO proponents have purported that there is no real difference between the two. Those who peddle this tired argument will have to resort to other lines of reasoning to justify their eating habits, as it flies in the face of the most current scientific research. "People choose organic milk and meat for three main reasons: improved animal welfare, the positive impacts of organic farming on the environment, and the perceived health benefits," said Carlo Leifert from Newcastle University, who headed the study. "But much less is known about impacts on nutritional quality, hence the need for this study." To analyze the difference between the two products, the researchers examined 170 peer reviewed papers on a host of animal products, like cheese, butter and milk, as well as 67 papers on various meats, making it unprecedented in this respect. The results of the study were published in the British Journal of Nutrition. What is responsible for this difference? The researchers did not look for a specific cause, but suggest the way in which organic animals are raised and the amount of grass they consume bear some responsibility. It should be emphasized that these results were not bound to organic food, however, but encompassed any products grown without pesticides and fertilizers. "Differences in content such as fatty acids or iodine occur primarily because organic animals are fed more of a forage-based diet, such as grass, than their non-organic counterparts," Ian Givens, a professor of nutrition at the University of Reading, who wasn't involved in the research, told sources. "You get the same kind of changes in food composition if non-organic animals are fed forage-rich diets too. It's the choice of feed, not the organic farming method, which makes the difference." It should also be noted that organic milk had 14 percent less of the adult daily iodine requirement than non-organic milk. Those who choose to consume only whole organic products should make sure that they meet their daily iodine needs. High quality iodine supplements are available here. Although the analysis focused on the abundance of omega-3 fatty acids, a separate comprehensive scientific analysis found that organic food has more antioxidants associated with better health than conventional food, as well as lower levels of toxic metals and pesticides. The latter study was published in the same respected scientific journal, the British Journal of Nutrition, which analyzed 343 peer-reviewed studies from across the globe. At the time, it was the largest study to analyze the difference between organic and non-organic fruits, vegetables and cereals. Professor Carlo Leifert at the Newcastle University, who led the study, found that there is a, "statistically significant, meaningful" difference between organic and non-organic food, the former of which had 19 to 69 percent more antioxidants than the latter. According to the team, the increased levels of antioxidant are on par with, "one to two of the five portions of fruits and vegetables recommended to be consumed daily and would therefore be significant and meaningful in terms of human nutrition, if information linking these [compounds] to the health benefits associated with increased fruit, vegetable and whole grain consumption is confirmed." Once again, researchers proposed that the superior nutritional content of organic food is thanks to how it is grown. Plants already produce antioxidant compounds that combat pest infestation. Since organic crops do not use chemical sprays, their antioxidant levels tend to be higher. In addition, organic food is bred for toughness and is not drowned in artificial fertilizers. The researchers also found higher concentrations of cadmium, a toxic heavy metal, in standard crops. In particular, pesticide residues were four times higher in conventional crops compared to organic crops. The study received funding from the EU and an organic farming charity. Unfortunately, the EU food standards are not reflected in the US. Approximately 80 percent of all packaged food in the U.S. contains genetically modified ingredients. This is one of the few places in the developed world where food producers are not required to disclose whether their products have been laced with genetically modified ingredients. That is why Mike Adams, the Health Ranger, personally tests all the products sold at the Natural News store. Although consumers cannot be sure where all their food comes from, they can rest assured that all the products that make their way to the Natural News store have passed meticulous testing for toxic heavy metals, microbiology, pesticides and more. The science is in and the results are clear. The nutritional difference between organic and non-organic food is not a fiction found only in the imagination of the new food movement. The difference is real. Don't let anyone tell you otherwise.